CAMBRIDGE, MA – Annual growth in the national market for home improvement and repair is expected to slow considerably by the end of the year, according to the Leading Indicator of Remodeling Activity (LIRA) released today by the Remodeling Futures Program at the Joint Center for Housing Studies of Harvard University. 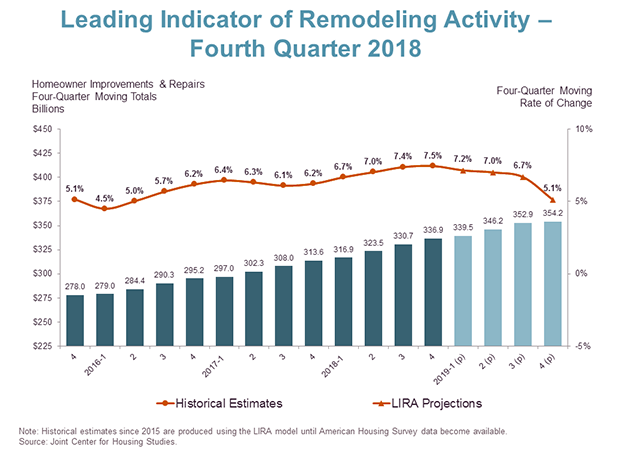 The LIRA projects that gains in renovation and repair spending to owner-occupied homes in the U.S. will shrink from 7.5 percent in 2018 to 5.1 percent in 2019. Click image for full-size chart.